This tutorial will show you how to make it appear that egg yolks have faces using blending modes. Open the main image you wish to use in Acorn, File ▸ Open. Choose Filter ▸ Color Adjustment ▸ Levels and click the auto levels button (keyboard shortcut ⇧⌘L). If needed, make adjustments to the saturation, brightness, and contrast via Filter ▸ Color Adjustment ▸ Color Controls. The saturation has been increased slightly in this image. Bring in your second image, File ▸ Add Images... A crying baby image will be used to give all the eggs faces. 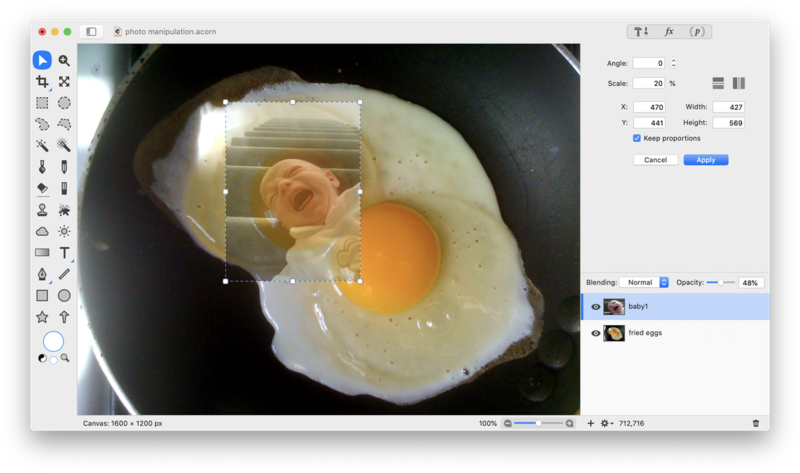 Resize the baby image by using Layer ▸ Rotate and Transform ▸ Scale and Rotate (⌘⇧T). Adjust the size until the face fits over the egg and double click to commit your work. The opacity of the baby layer was decreased to 40% temporarily in order to see how it fits on the egg yolk. Set the blending mode of the layer to Pin Light. Select the eraser tool in the tools palette. Erase everything but the mouth, nose, and eyes. Repeat this process to give the other yolks faces as well.